Finally got in a pretty high quality long run. 21.75 in 2:41:17 (7:25 pace). I started out with about seven hilly miles in Sugarhouse Park. I exited the park at the Garden Center entrance by Highland High and then followed the Salt Lake Half Marathon route to Liberty Park. Circled the path for several miles around Liberty, with some detours into the surrounding neighborhoods. It's nice to have a day off. I plan to do some yardwork, hang out with the kids, and maybe catch a little of the Masters. Complete day off. Felt good. Seven miles over the Best Buy Loop. Did six fast 100 meter strides after. Six miles at Sugarhouse Park. Gully Long Run. Beautiful, sunny day for a trail run. This is the kind of run I'd do every day if I were just concerned with health and fitness and not obsessed with holding back old age and improving my racing times. I ran an easy 2.5 miles with my team today. They have the Davis Invitational tomorrow and I have the Salt Lake Half. Ran a few fast striders on the football field after. I had a great day at the Salt Lake Half Marathon. 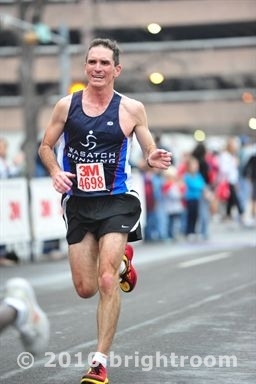 The only downside was that I got passed in the last couple miles by another masters runner. Anyway, the 1:15:31 that I ran today was significantly faster than the 1:18:06 I ran last year. I ran virtually the entire race alone. It would have been nice to have had a group of guys to work with. My kids with their cow bell really helped at two or three points along the way. I ran seven miles in 56 minutes when I got home.